Vicksburg, Mississippi, circa 1900. "The levee." And the sternwheeler Falls City. Dry plate glass negative, Detroit Publishing Company. View full size. Submitted by Fitzz on Fri, 11/06/2009 - 10:00pm. What a gloriously rich image. The detail cries out to be examined further. Thanks for posting it! Submitted by Jazznocracy on Fri, 11/06/2009 - 1:31pm. Chautauqua Lake in western New York State had, like most comparable bodies of water in that era, an extensive fleet of large steamboats. The Lake steamers were all (except one) screw driven, with deeper drafts. But otherwise they were very similar to this. The last Chautauqua steamer was the City of Jamestown, about 110 feet long with two decks. It ran frequent excursions though the 1950s. I vividly remember it pulling into the pier in 1951 or 52, belching steam. I never ran so hard in my life as when I ran down to the water to see that magnificent vessel. My own personal little Mark Twain memory. Submitted by Anonymous Tipster on Wed, 11/04/2009 - 8:47am. Those occupations haven't vanished, Anon. As a Cincinnati-based musician, I've worked enough riverboat gigs that the romance has faded, and my first thought is always what a PITA it is to haul equipment down to the docks. Most American river cities have at least a few excursion boats working the river, and all those boats have pilots (although, sadly, you're more likely to hear recorded music these days). I've had a few conversations with riverboat pilots, and they're a really interesting bunch. Steam has been mostly replaced by diesel, and the paddlewheel is more than likely decorative, but those jobs are still out there. And those riverboats where the sounds of jazz were first heard? They were primarily excursion boats, just like today. Submitted by Anonymous Tipster on Tue, 11/03/2009 - 4:46pm. this scene could as easily be 1850 instead of 1900. Until I looked at the gent sitting on the barrel center front, his clothes give him away as "not 1850." Submitted by Jimmy Longshanks on Mon, 11/02/2009 - 9:00pm. Could not find pricing for Vicksburg to Greenville, but comparable short trips in Mississippi and Louisiana were about $8 for a cabin, and $1 to $2 for deck passage. Submitted by Kevin Slark on Mon, 11/02/2009 - 2:04pm. I imagine that the cost of taking the Falls City from Vicksburg to Greenville was incredibly cheap as by 1900 the Illinois Central ran multiple trains a day on their Yazoo and Mississippi Valley Railroad between Memphis, Leland, Vicksburg, Natchez and Baton Rouge. At Leland, the Southern Railway of Mississippi could take a passenger 15 miles west to Greenville. Does anyone know riverboat fares from 109 years ago? Per some of my Gulf & Ship Island Railway documents from 1902, it cost $1.25 to travel from Jackson to Hattiesburg, a distance of 95 miles, and I imagine that in those highly regulated days the fare for the journey between two cities of similar distance would be similar. I should have been a historian. Submitted by Anonymous Tipster on Sun, 11/01/2009 - 9:41pm. Two jobs I would have loved to have, but are forever unavailable: (a) Paddlewheel Riverboat Pilot; (b) bandsman on the nicer passenger boats. Lot of the groundwork for early jazz got laid down on those boats. Submitted by dB on Sun, 11/01/2009 - 7:24pm. What intrigues me most about this shot is how well motion has been stopped. The horses’ movement and even the water flow from boat to river. Most photos from this era seem to blur anything with the slightest motion. What were the capabilities for shutter speed given the emulsions of the time? Just lucky to have an extremely bright day? Submitted by Jimmy Longshanks on Mon, 11/02/2009 - 1:22am. According to Way's Packet Directory, there were five boats named Falls City. This appears to be the last, built in 1898 at Cincinnati. 132 feet long, owned by the Louisville & Kentucky River Packet Co. The book notes that the boat was not taken to Vicksburg until 1908, but it was common practice for boats to "tramp" when work was slow in their home trade. Submitted by GlenJay on Sun, 11/01/2009 - 12:02pm. Although there are towns with this name in Nebraska and Oregon, the Falls City name likely refers to Louisville, which owes its existence to the Falls of the Ohio River. The late lamented Falls City Beer was brewed in Louisville starting in 1905. 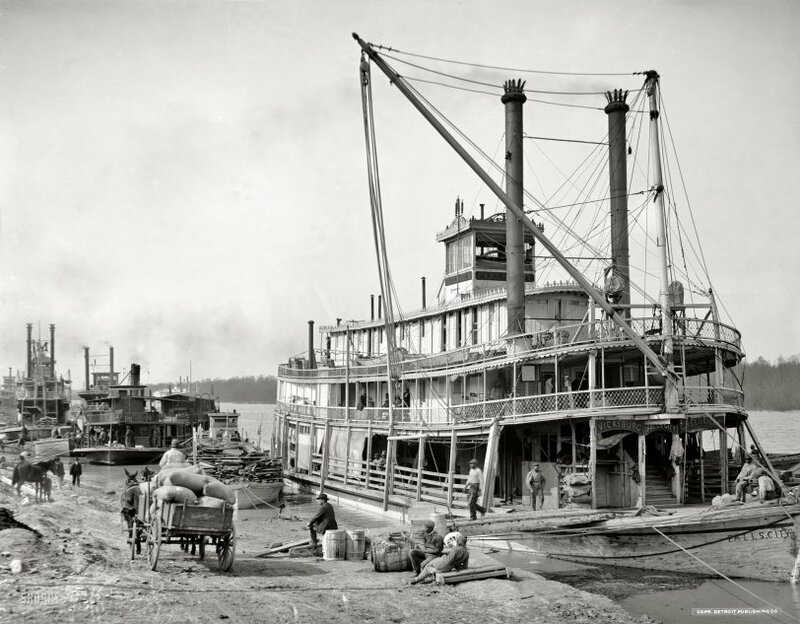 From the signage it appears that in 1900 this sternwheeler was working the Mississippi between Vicksburg and Greenville. It had come down in the world, literally. Submitted by Anonymous Arkie on Sun, 11/01/2009 - 10:51am. A stage set for "Showboat"! I can hear "Old Man River" just as plain as day! Thanks. Look! There's Howard Keel! Submitted by CB_Photo on Sun, 11/01/2009 - 9:03am. Cameras back then were bulky and required time to set up. Nowadays this shot could be taken while walking past the scene. While the photographer didn't try to make this shot "casual", it has that look about it. Because of this, we see a more accurate glimpse of what life was like then. The detritus in the water, the men (only men in this scene) waiting for business and/or passengers, the six or seven ships in the background all show a thriving economy.